Dedh Ishqiya is a 2014 Indian black comedy thriller film directed by Abhishek Chaubey and it is a sequel of Ishqiya and is produced by Raman Maroo and Vishal Bharadwaj. The film stars Madhuri Dixit, Arshad Warsi, Naseeruddin Shah and Huma Qureshi in the lead roles, while Vijay Raaz, Shraddha Kapoor, Manoj Pahwa, Ravi Gosain, Bhuvan Arora plays a supporting roles. Music of the film is composed by Vishal Bhardwaj while lyrics have been written by Gulzar. 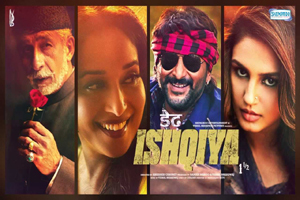 Here is the link of all the songs lyrics and videos of Dedh Ishqiya.